HP is adding a 2-in-1 tablet to its ZBOOK line of mobile workstation computers. The new HP ZBook x2 isn’t the first tablet to ship with a detachable keyboard and support for an optional digital pen… but it’s certainly one of the most powerful to date. The computer features a 14 inch, 3840 x 2160 pixel display, support for up to an Intel Core i7-8560U Kaby Lake-R processor, NVIDIA Quadro graphics, 32GB of RAM, and up to 2TB of solid state storage. But those kind of features come at a cost: prices for the ZBook x2 start at $1749. The tablet has a built-in kickstand and comes with a detachable backlit keyboard. Since the keyboard connects to the tablet via Bluetooth, you can continue to use it even when it’s not touching the computer. But the tablet weighs 3.65 pounds, making it kind of heavy for a 1.1 pound keyboard to hold up… so if you’re using the ZBook x2 in laptop mode, you’ll need to use the kickstand. The pen is sold separately, and uses Wacom EMR technology. 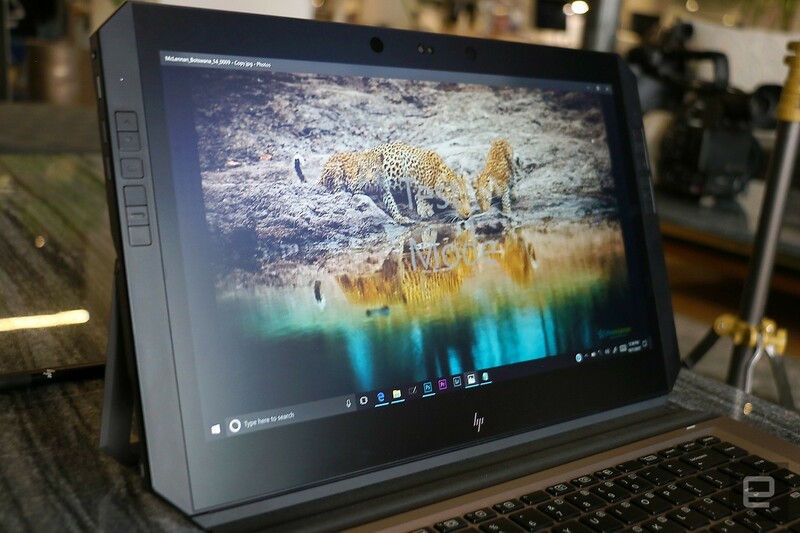 HP says it offers 4096 levels of pressure sensitivity and supports tilt detection and has an erase function. There’s no battery in the pen, so you don’t have to worry about keeping it charged. HP’s tablet features two Thunderbolt 3 ports, an HDMI 1.4 port, a headset jack, an SD card reader, and a power connector (although you can also charge the tablet with a Thunderbolt 3 adapter, which supports up to 100 watt of power delivery). You can connect up to four external displays to the tablet (or two 4K displays). The tablet’s display features an ant-glare, matte-like finish and a chemically etched surface to make it feel more like paper than glass when you’re dragging the digital pen over the surface. It also supports 100% adobe RGB color gamut. While each model will ship with NIVDIA Quadro M620 graphics and 32GB of RAM, HP will offer a range of CPU and storage options, starting at an Intel Core i7-7500U processor and 128GB of SSD storage. HP says the storage is not user upgradeable, so if you think you’ll need more than that, you should probably pay for it up front. As you’ve probably guessed, this tablet isn’t exactly compact and it isn’t fanless: there’s a dual fan system designed to help keep the hardware from overheating. The HP ZBook x2 measures about 14.4″ x 9″ x 0.6″ and weighs 3.65 pounds. Add the keyboard and you’ve got a laptop-style device that measures 14.4″ x 9″ x 0.8″ and which weighs about 4.8 pounds. Other features include a fingerprint scanner, a Smart Card reader in the keyboard, fast charging (from 0 to 50 percent in 30 minutes) and the tablet has been MIL-STD 810G tested for ruggedness. The tablet has an 8MP rear camera and a 720p front-facing camera. The HP ZBook x2 should be available starting in December. The HP site says “anti-glare” but where is the evidence that this means “matte”? Usually, manufacturer statements like “anti-glare” in practice only mean “glare but not with the worst reflectance” but do not mean “matte”. 16:9, thick and edges with corners make the device unttractive. The tablet is a rugged-grade beast of a laptop! The phrase HP used in their phone briefing was “matte-like,” but I haven’t seen the tablet in person, so I can’t speak to whether it’s truly matte or just less shiny than your typical glossy display. Thank for the picture! Yes, this looks matte or semi-matte if we assume realistic photographing. HP needs to learn to call matte what is matte so that we can easily distinguish it from HP-anti-glare. The catch with 4×3 is that a 15″ screen is larger than a 16:9 one and hence more expensive. We are seeing the same with phones where tiny 2:1 screens have a large diagonal measurement. With the Mate 10 reviews most reviewers refer to the 6″ screen as bigger than the 5.9″ when it is actually 3% smaller because of the aspect ratio. And as always – HP forbids retailers from sending their HW abroad. Can this interface to another computer like a cintiq can? Any word as to how customization the keys are? Also I kinda wish that this setup had a place to put the pen built in and a 4:5 display and a touch sensitive bar/wheel like wacom devices, but other than that this device is pretty much is exactly what I’ve been complaining wacom hasn’t been making (like the more reasonable price/specs, longer battery life and the THUNDER PORT 3 which can power, data transfer, and act as a display port at the same time which means that the device would only need ONE wire instead of three! ).